I regret to inform you that Green Ice Nursery has now closed. The entire collection of Jan Bravenboer's cyclamen plants are now being taken care of by Jo Hynes, Jo holds the National Collection of Cyclamen in England. I think Jo and her husband Tom are the right persons to take care of Jan's collection. Jo's passion and enthusiasm for Cyclamen is simply overwhelming. Jo will try to make available seeds of plants you desire. I would like to ask you to contact her directly now for all your Cyclamen-wishes. Thank you all for being such great customers through the past years. 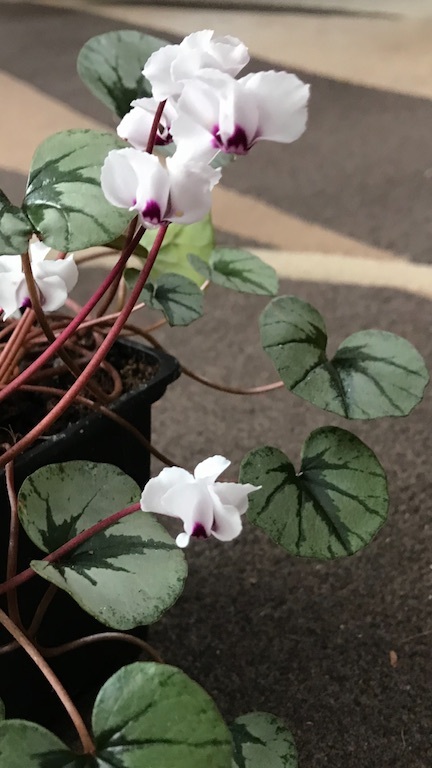 I think back to a great time helping Jan with the Cyclamen and they will always have a special place in my heart, but now he is gone the collection will be taken care of by Jo, it is time for me to open a new chapter in my life. This Cyclamen coum seedling was the last selection Jan greatly admired. It is intended that this special selection will be named for him.